Wait…what are herps?! Herps is the term used to collectively describe reptiles and amphibians. The study of both is called herpetology. Herps are a crucial part of a healthy ecosystem; but they’re also the most sensitive to pollutants and harsh chemicals. 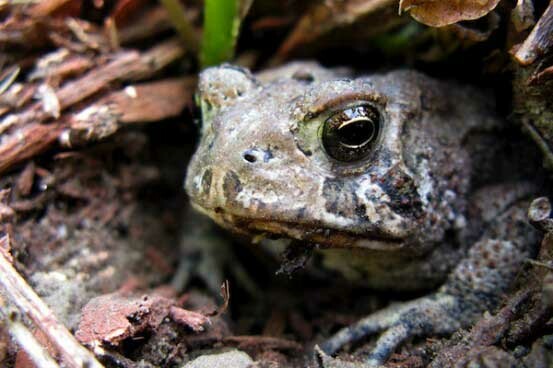 Have you noticed a decline in frogs, lizards and snakes in your garden the last few years? With all the environmental hazards posed to these creatures, it’s understandable why they haven’t come back to nest in our landscapes. If you’re missing the herps in your garden, there is a solution to bringing back those happy herps: Going organic can bring back your herps. Among the reasons to go organic in the landscape, making a herp-friendly environment is definitely one of the best ones. Frogs, lizards and snakes eat bad bugs and rodents that wreak havoc on your plants and in your home. They even eat mosquitoes and mosquito larva to keep spring, summer and fall infestations under control. When you add harsh chemicals to your lawn and garden, you can cause irreparable damage to beneficial reptiles and amphibians. Offer your visiting herps cover. Thick shrubs and small rock piles with cracks create places for lizards and toads a place to nest and hide. Wood piles (not piled up against the house) and other forms of cover also give them a place to hide from predators and the elements. Small, overturned clay pots often become home to toads. They have to eat! Since your landscape is all organic, you should have both good and bad bugs that herps can forage for. Good snakes such as garter snakes, will also devour insects in the garden. Basking spots. Reptiles love the sun. After feeding, they’ll want a place to warm their belly so their food will digest properly. Large stones are excellent design elements in the landscape. Water. Small ponds are a magnet for frogs and many other types of beneficial wildlife. Patience. If you provide it, they will come. Going organic, growing lots of vegetation and providing shelter will all encourage a variety of reptiles and amphibians to make your garden their home. What kind of herps will you expect to find? A variety of toads, tree frogs, anoles, geckos, and non-venomous snakes such as garter, rat and water snakes. If you have a larger pond on your property, you might even find turtles! If you live near a lake in the Dallas area, such as White Rock Lake, you may find you’ll attract a more abundant population of herps. Once you see the lizards and toads thriving in your garden, that’s a great signal that your organic landscape is coming into balance. A benefit of being on our Soil Building program long-term is that, over time, you will see an improvement in both the beneficial insect and herp population. Are you ready to go all in and make a change to an organic landscape maintenance program? Give us a call for all the details or visit us online for a FREE quote.